Discussion in 'MacRumors.com News Discussion' started by MacRumors, Mar 16, 2018. Over the course of this week, we've been taking a look at Samsung's new flagship smartphones, the Galaxy S9 and the Galaxy S9+, as these two devices are the iPhone X's biggest competition. In our latest video, available on the MacRumors YouTube channel, we compared the Samsung Galaxy S9+'s dual-lens camera with variable aperture to the vertical dual-lens camera in the iPhone X.
Samsung decided to focus heavily on image quality in its latest devices, and the S9+ has a 12-megapixel f/1.5 to f/2.4 variable aperture lens as its main camera, which is paired with a 12-megapixel f/2.4 telephoto lens, similar to what's available in the iPhone X. 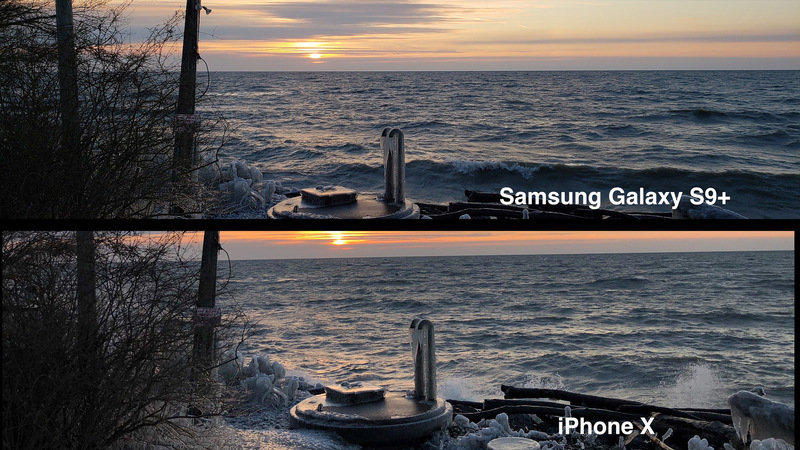 A variable aperture is unique to Samsung's new devices, and it offers some benefits that are going to improve image quality. With a variable aperture, it's easier to find a balance between light and image quality. The iPhone X has two lenses like the Galaxy S9+, but no adjustable aperture, and that gives the S9+ a bit of an edge. 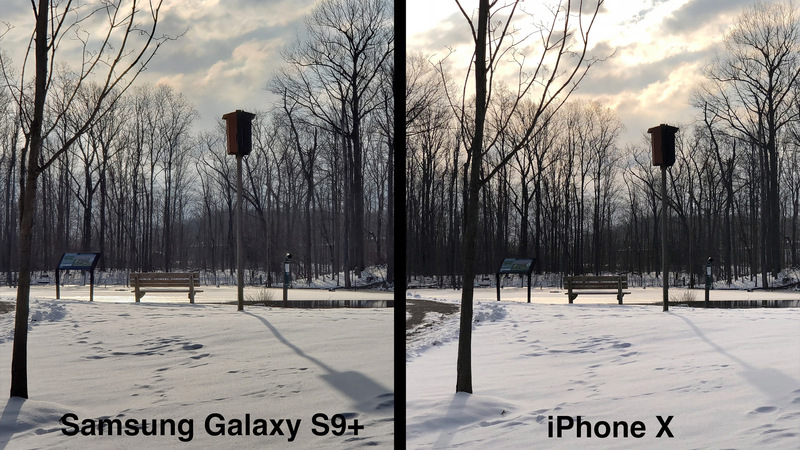 As you'll see in the images below, though, both the iPhone X and the Galaxy S9+ have fantastic cameras that are capable of taking some amazing images. 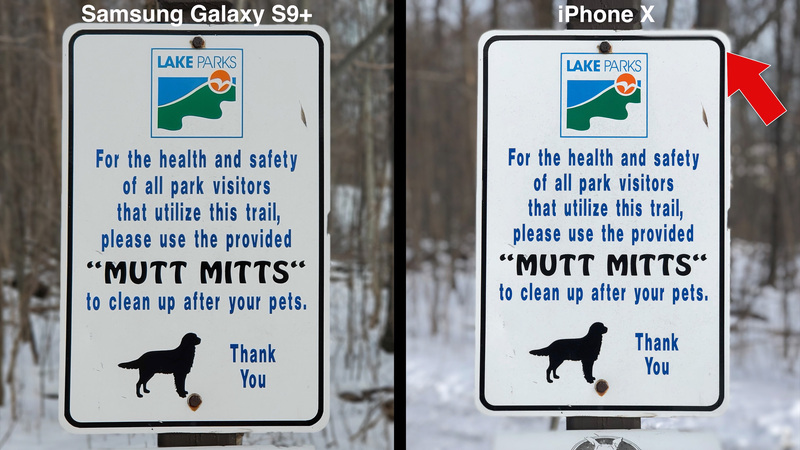 The Galaxy S9+ has a "Live Focus" mode that's similar to Portrait Mode on the iPhone X, and the photo below compares Live Focus with Portrait Mode. Both of these modes have some issues, but making adjustments to blur is easier on the Galaxy S9+, which gives it the win over the iPhone X. In general, the Galaxy S9 also has more built-in image editing tools with its Pro Mode for taking manual photos. In addition to images, we also took a look at video modes. Samsung's Galaxy S9 can record in slow motion at 960 FPS, a unique feature because the iPhone X's slo-mo maxes out at 240 FPS. Both devices can also record in 4K video with optical image stabilization, but the Galaxy S9+'s video was less jittery. The iPhone X did win out when it came to suppressing outdoor wind sound, though. Of course, Apple is going to be introducing the successor to the iPhone X in about six months, and with the camera improvements that come with every new upgrade, it's likely iPhones coming in 2018 will outshine the Galaxy S9+. Make sure to check out our other videos, which have compared the Galaxy S9 to the iPhone X and pitted Animoji against Samsung's new AR Emoji. 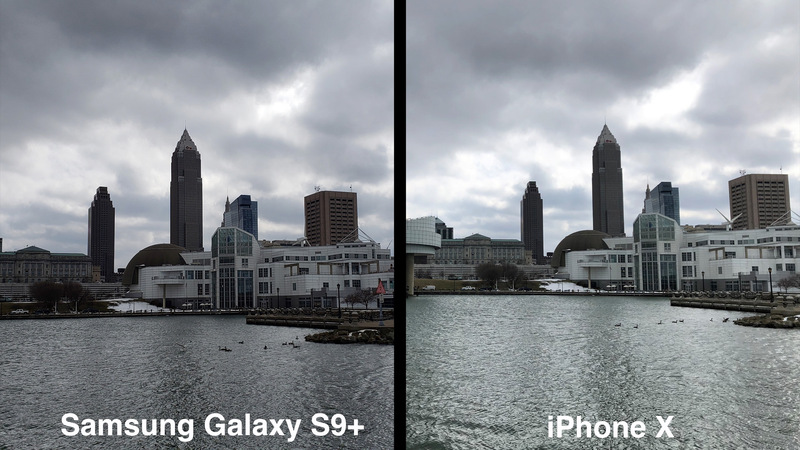 Article Link: iPhone X vs. Galaxy S9+: Which Smartphone Has a Better Camera? Ramchi and bmot like this. Skoal, Preclaro_tipo, LordCoe13 and 45 others like this. My preference is for the iPhone X photos in all cases. The Samsung pics look a bit murky at times and—who knows—maybe the Samsung more accurately portrayed the reality, but the photos I would want to keep are the iPhone X.
Skoal, Preclaro_tipo, LuckyBubba and 39 others like this. Skoal, Preclaro_tipo, Ed A. and 26 others like this. If we could increase the electron well capacity of phone image sensors, we'd have images that would be indistinguishable from dSLRs so we don't get these blown highlights anymore. Apple/Samsung/Sony etc.. really needs to figure out a process that improves electron well capacity. Also, improve the bitrate for videos so that videos don't look like a blurry mess. And give us full raw editing. JackANSI, Darkwalker, alex cochez and 1 other person like this. I remember the days (between the 3G and 4S), when almost ever day people kept saying a camera in a phone didn’t matter, or the cameras were already “too good” and taking photos was such a low priority for a phone. Now most of the comments I seem to read on these articles are from self-proclaimed pro photographers who scoff that when you enlarge these excellent phone photos, there’s some rough artifact and they can never compare to their 5K DLSR. It’s just funny how times change. Skoal, Matz, willmtaylor and 20 others like this. Don't know about everyone else, but I buy my phone ONLY for its ability to take photos. Making calls, browsing internet, and apps all take a back seat. iPhone X seems to be the better choice here. jerryk, VanZan, slineaudi and 21 others like this. Smart phone cameras are so close in comparison today producing excellent photo’s, the average consumer likely doesn’t see major differences. The biggest contributor is what smart phone manufacturer (Apple or Samsung) the consumer chooses to use, which Thats the only camera that matters really. slineaudi, passionfruit, palmerc and 6 others like this. Can you do a drop test from different height and then test if the aperture still works ?? Did any Tech youtube address this??? ConfusedChris and orbital~debris like this. Which images do you prefer? Personally? Sony α7R III, heh. Kobayagi, shadowbird423, dhershberger and 10 others like this. Yeah, the differences in image quality are small and you're not going to notice them in the average picture, honestly. They're very, very close. I think the Galaxy S9+ is eking out more detail and it's not blowing out the highlights quite as much in some of these photos in particular, but the iPhone X is still amazing. Both really have their strengths and weaknesses. I always look forward to the improvements we get with each new iPhone, so I can't wait to see what we'll get in 2018. Matz, willmtaylor, MyMacintosh and 11 others like this. I prefer the iPhone in these comparisons but seriously, does it even matter at this point? They're all great. scrapesleon, PlayUltimate, Will.O.Bie and 7 others like this. Seems most agree they're all great, and it comes down to preference and trade-offs. Here's to looking when these 2 phones are similar in almost every respect! Good for Apple? agood for Samsung? We'll see. Or maybe Google will steal the show! Cloudkicker and jclo like this. I would have been nice to have a third set of pictures taken with a professional DSLR to compare. Both pics look good, but we can't tell which one is closer to reality. ohio.emt, pentidoes, Pufichek and 6 others like this. Neither. Pixel 2 still has the best overall camera with a single lens. It’s not so much about the hardware anymore it’s about improving the software. Hint hint Apple: fix your buggy mess while you’re at it. JackANSI, BladeRunner95, big-ted and 14 others like this. I think the iPhone X pictures look better. fourthtunz, elmaco, Statusnone88 and 9 others like this. Why don't we ever see any reviews about call quality comparisons? Why is it that phone manufacturers never say a peep about call quality- when it arguably is the most aggravating aspect of these phones? It's always camera this & camera that. Hello- its an i PHONE. AbblePC, Stars&Stripes, arefbe and 9 others like this. Looks like both are fantastic cameras. At this point the tech is getting to a point where I'm personally having difficulties distinguishing between photos taken on a flagship phone, and really don't care which model scores 2, or better yet 1 point out of a 100 more than the other on tests. That just seems trivial. If you're not a professional, either of these cameras will most probably serve you very well. Pufichek, Darkwalker, scooterv51 and 1 other person like this. Both are good, but my subjective preference is the iPhone X. Apple's image processing engine is really good. VanZan, fourthtunz, Statusnone88 and 5 others like this. JackANSI, brdeveloper, big-ted and 2 others like this. It's on a level where I can't pick a clear winner. S9 has way better low light quality IF there is no light source visible in the picture. Once you have a light in a dark environment, it seems to totally screw up and blur anything around the light. pentidoes and orbital~debris like this. With that said Google has the best processing. JackANSI, Thierry ba, brdeveloper and 7 others like this. It would be nice to have a third reference image taken with a high quality professional camera for comparison. AbblePC, Matz, willmtaylor and 6 others like this. Do people really prefer shooting 720p 960fps for 0.2 seconds over 1080p 240fps for as long as you want? It really seems not very useful to me. willmtaylor, AppleFan78, xDKP and 3 others like this. The last photo really shows my biggest complaint with iPhone photos that's been ongoing since iOS 7: the super aggressive noise-reduction that makes everything look like a painting. Even in outdoors during the day, noise cancellation makes it all terribly blurry. JackANSI, brdeveloper, MacLoveMacHate and 24 others like this.